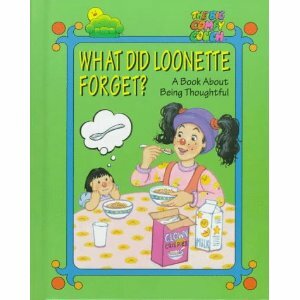 What Did Loonette Forget: A Book About Thoughtfulness by Gavin Jackson as you can guess is a book about thoughtfulness. I was watching my daughter today as she was getting her inner nurturing on. She put her bear in her stroller, made sure it was strapped in properly and she needed to push the stroller. About every 15 minutes we needed to stop so she could let her bear out, hold it on the fence so it could go to the bathroom. Then she would strap it back in and on we’d go. It made me think about acts of kindness and how much more we can do. Think of how much crap we deal with at work alone that would be different if people were just more considerate and kind. Certainly it’s something common to be taken for granted in relationships as well. How many people don’t send thank you cards? Holiday cards? My daughter can take a piece of paper, glob on a bunch of paint, smear it all around and it’s seriously the greatest thing in the world. She’s proud of her creation and it’s something she wanted to make. At some point though, a home made gift becomes tacky. Why is that? It should be about the thought, not the gift, right? It’s really refreshing to see a 3 year old want to help so much. Hopefully that’s something that stays with her for a lifetime. Watching her certainly inspires me to be more thankful and appreciative. Nasty People ; Jerks, it seems, will always be with us. Can you rid your company of them? Are there things you feel you can do more to show a more thoughtful side? Do you think kids who show to be more helpful early in their life hold onto that?